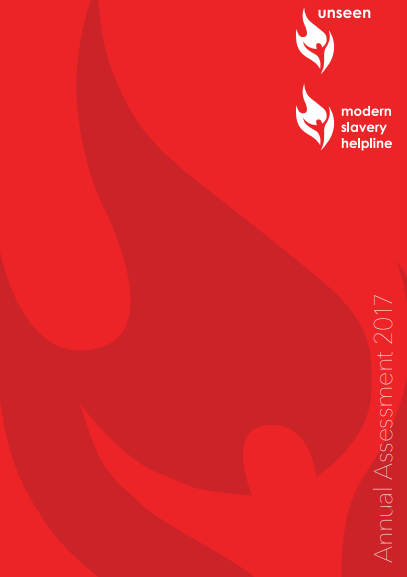 string(1102) "Resource Centre > Uncategorized > UK Modern Slavery Helpline: Annual Assessment 2017"
The UK-wide Modern Slavery Helpline and Resource Centre was established in October 2016 to provide victims, the public, statutory agencies and businesses with access to information and support on a 24/7 basis. Operated by Unseen, in its first full year of operations, the Helpline received 3,710 calls which indicated a total of 4,886 potential victims in situations of modern slavery from 94 different nationalities. The Helpline also received 710 webforms through its online reporting service. A total of 1,271 modern slavery cases were indicated during 2017. Calls are received from members of the public wanting to report a suspicious situation, frontline workers seeking guidance and advice on modern slavery, businesses wanting information about transparency and potential forced labour situations and potential victims wanting help and advice about their situation. The Helpline receives around 10% of its calls related to modern slavery from potential victims themselves. A further 44% of calls come from someone in direct contact with a potential victim. Many different situations and types of exploitation have been reported to the Helpline highlighting the diverse nature and scale of modern slavery in the UK. During 2017, the Helpline calls indicated a total of 3,540 potential victims of labour exploitation/forced labour from a range of sectors and industries including car washes, construction, nail bars, hospitality, agriculture and manufacturing. 774 potential victims were also indicated in situations of sexual exploitation. Criminal exploitation and domestic servitude also featured predominantly with 52 cases of criminal exploitation and 128 cases of domestic servitude. In 2017, the Helpline made a total of 1,442 referrals to other agencies and organisations demonstrating Unseen’s commitment to sharing information with those who can prevent modern slavery crimes and protect vulnerable individuals. These referrals were made to every police force in the UK, the National Crime Agency, a range of NGOs and the Gangmasters & Labour Abuse Authority.